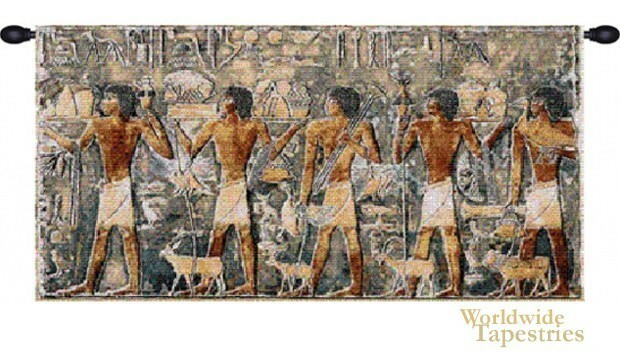 This ancient art tapestry Saqqarah Blue Part II shows the sacrifice of animals for the pharaoh. The region of Saqqarah is renowned for its magnificent architecture of pyramids and mastabas, and the art which accompanies it. The procession is seen here with colors of blues, browns and creams. This piece of ancient Egypt is a work of art which reveals life in ancient Egypt as a historical document. This Saqqarah Blue Part II tapestry is backed with lining and tunnel for easy hanging. Note: tapestry rod and tassels, where pictured, are purchased separately.